An ode to Lady Gaga’s red lace dress at the 2009 Video Music Awards. In a world going increasingly digital, photographer Jesse Freidin dares to buck the trend. A loyal fan of traditional analog photography, he found himself in a unique position—desiring to do something to celebrate the unique and disappearing art of instant photography and in possession of the two of the last packs of original Polaroid instant film in the world, thanks to The Impossible Project, a Netherlands based company dedicated to reviving instant photography and manufacturing instant film. “I focused on how I could make something as different and beautiful as possible,” he says. 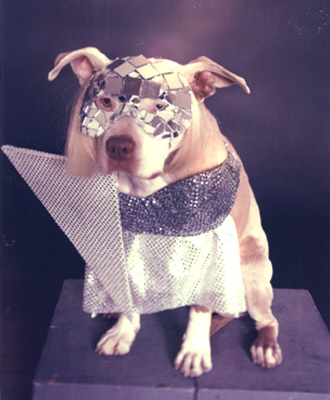 The result, a series of bright, offbeat, Polaroid-hazy photographs of dogs dressed in outfits made famous by Lady Gaga, became an internet phenomenon that no one, least of all Jesse, could have predicted. 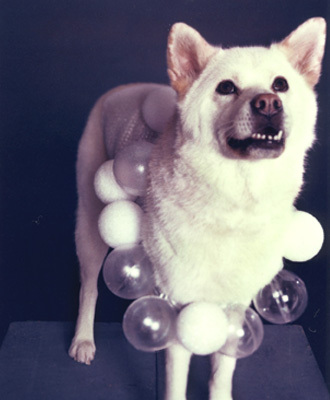 The dogs featured in the famous photos aren’t letting fame go to their heads. After all, they’re pretty used to attention and affection. 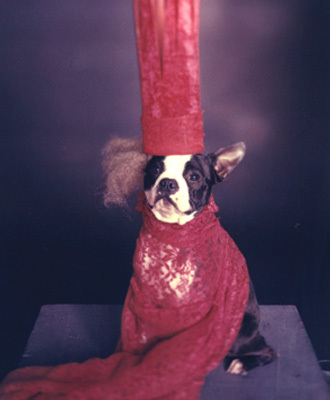 The photographs feature Pitbulls Gunther and Booker, Shiba Inu Kiku, Xochitl the Mexican Hairless, and Pancake, Jesse’s own Boston Terrier. To check out more on the Lady Gaga Project, as well as Jesse’s other work, check out his site at jessefreidin.com. 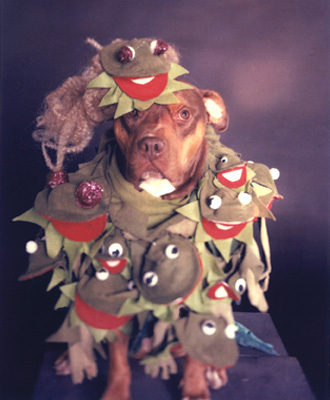 Freidin says, "The Doggie Gaga Project is my alter-ego." This look is a recreation of Lady Gaga’s Kermit the Frog poncho worn during a German television interview in 2009. This space-age disco look was inspired by the disco ball dress Lady Gaga wore at T in the Park Festival in Kinross, Scotland in 2009.